Learning from some of the greatest entrepreneurs of our time is something we need to make a priority. Steve Jobs is one of the most influential men from this century—hands down. 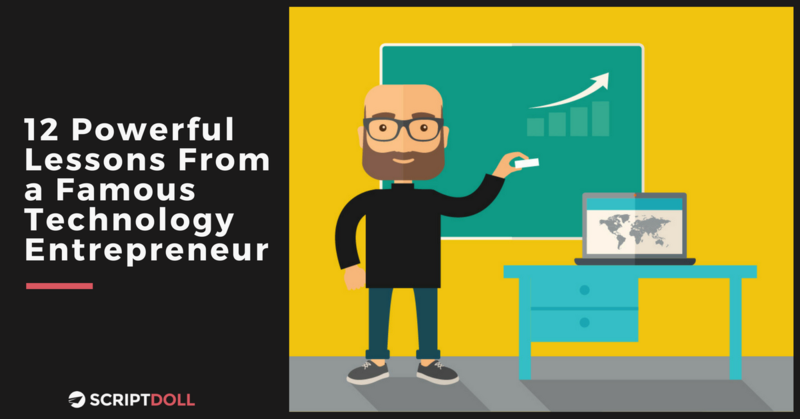 So, it’s obvious that savvy business owners like you should be looking to him for help with finding inspiration for your business endeavors. Steve left an impact on many people—in and out of the entrepreneurial world. Thus, Guy Kawaski—a tech venture capitalist and author—gave a talk at a Silicon Valley Bank summit to share the 12 lessons he learned from Steve Jobs during his time at Apple. You’ll find that they apply to all business situations. He advises against listening to “gurus.” Reason being, they’re often disconnected with customers and can only tell you what they think is right. Jobs didn’t listen to experts. Experts listened to him. Therefore, hear them out, but don’t rely on them to figure things out for you. Customers in 1983 would have said they needed a bigger, faster, and cheaper Apple II. No one would have dreamed to ask for a computer with graphics, a mouse instead of cursor keys, or a trash can in the lower right-hand corner. They couldn’t describe what ended up being provided to them. And, that explains why Jobs was against focus groups. After all, customers only describe what they want in terms of better, faster, and cheaper by a 10 percent improvement. If you want to be an entrepreneur, you cannot listen to customers. Instead, use your likes and dislikes to create something you would want to use. The best work of Jobs and Kawasaki’s careers was when they were presented with the biggest challenges. That’s when they rose to the occasion. So, go ahead and give coworkers and employees magnificent challenges. That’s how to truly get the best work out of people. In a world where everyone is talking about price, there are actually lots of people who care about design. This is contrary to what most experts will tell you. They say most people are price sensitive, but Apple disproved that. As a result, don’t think of design as simply the layer on top of your great engineering. For most people the product is the design. Most of Jobs’ presentation slides were created with a minimum of 60 point font. Compare that to other tech speakers’ slides at about eight point font, which no one can read. It’s no wonder Jobs was the best product introduction guy. Don’t just do things 10% better, Instead, do things 10 times better. A historical example proves this point. In 1900, ice could only be provided by being harvested from cold climates where water was frozen. Thirty-three years later, ice factories came along. You could freeze water any time of year and the ice man would deliver to your house. And, fast forward another 22 years, which brings us to the refrigerator. Value and innovation occurred because you went from one curve to the next. Unfortunately, the ice harvesters died as ice harvesters and never moved to the next curve. Same thing with the ice factories. They didn’t invent the refrigerator. The real innovation happens on the next curve, not on the curve you’re on. In other words, don’t worship religions or fads. Apple went back and forth on whether they should have an open or closed system. They didn’t get stuck on one or the other and have since changed their policy to fit what works best. People used to beat Jobs up about price. Everyone said the Macintosh was too expensive. Later, the iPhone was too expensive. But, there are classes of people that care about value, which is actually different from price. And, where price is concerned, is it truly more expensive if you consider the increased productivity, ease of use, and decreased costs required for support? Apple serves as a testimony that people will pay for what is unique and valuable. The moment you lower your standards and hirer a B player, the “Bozo explosion” starts. This is when those hiring employees keep hiring players below their level. They are afraid to hire people as good as them because they’re afraid they’ll be shown up. As a result, you wake up one day and you’re surrounded by bozos. So, a CEO should certainly take great pride in hiring people better at their job functions than they ever could be. If you can’t demo your own product, quit. No one could do a better demo than Jobs. The first version of the laser printer from Apple was $7,000—slow, single-sided, no envelopes, letter size paper only. It was a piece of crap. But, a revolutionary piece of crap. If they had waited for the perfect world of double-sided, envelope feeding, big ram, they never would have shipped. Ship something that’s jumped curves and has elements of crappy to it. Most of the time, this is said the opposite way. But, not for an entrepreneur. You have to believe in your product. And, you have to ship your product. Then, people will see it and you will see it. If you don’t believe, it will never happen. If you wait for customer validation, it will never happen. The reason Macintosh was so successful was because, at its core, 100 people believed in it. And, because they believed, they made it real. Okay, the cat’s outta the bag. What are you going to do with all this insider information? Hopefully you’ll be creating the best products and services possible! Keep pushing yourself to stand apart from your competitors. And, while you’re at it, hire the best and the brightest along the way. One thing we at ScriptDoll can do to get you started is help you communicate your message to you customers. We’ve got a team of some of the best copywriters in the world who’ve created content that sells. At the end of the day, isn’t that what you’re after? Thought so. So, let us join YOUR team! For only $1, you can try out ScriptDoll today and get access to some of the best sales content available. What are your waiting for? !